Business attire doesn't have to be boring! This clever update to the 9-to-5 staple zips seamlessly around the collar, giving your no-nonsense dress shirt a quirky focal point that doesn't take itself too seriously. 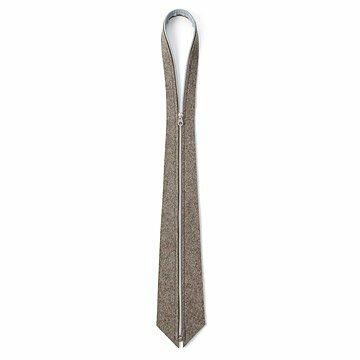 The thick, 100% merino wool felt can be tamed with a simple zip, bringing a welcome dose of levity to this standard piece of office-wear. Hand-cut and sewn in San Francisco, California. Josh Jakus is a Berkeley, California-based designer dedicated to making experiential connections between form and function. When a person uses one of his products, they naturally encounter the way it was conceived and developed. Achieving such connections requires a strict material sensibility--using materials in their simplest form so intrinsic qualities show through, and a rigorous design efficiency that strives to get the most impact out of the fewest moves. Josh founded his design practice in 2005 as a way of continuing his lifelong interest in the nature of structure, space and materials. Though his design practice is driven more by intellectual curiosity than pragmatism, Josh is still happiest making things that are meant to be used. An architect by training with an Masters of Architecture from UC Berkeley, Josh uses his understanding of the built environment and how it is inhabited to inform his designs, and he hopes his products will help foster a more intuitive understanding of all objects in the people who use them. It's perfect if it looked like an usual Tie. Also there is a room of improvement of the material used. You cannot beat this tie as a protest and conversation piece. Even my boss asked me about it when he is the reason I wear it to work with his aged tie requirements on certain days of the week. My only complaints are: 1. Price is absolutely outrageous for what this is. Essentially a piece of cloth with a zipper sewn on. 2. No color options (black, darker brown definitly needed....) 3. And did I mention the price is way too high? A real conversation starter! You can zip it all the way up nice and proper, or down a notch to look more casual. I wish it came in more tie-like colors. It's okay but needs work... for instance, there's no sleeve covering to hide the zipper which would be ideal, also should be in black to go with more clothing outfits... also it's really overpriced... I would expect to pay less than half the asking for this as is... it's nifty, but it's not ready yet. This clever update to the tie zips seamlessly around the collar.